From super fun to stylish, I aim to create a go-to collection for gals looking for truly individual and well made jewellery that suits your character and ignores any 'on trend' nonsense. 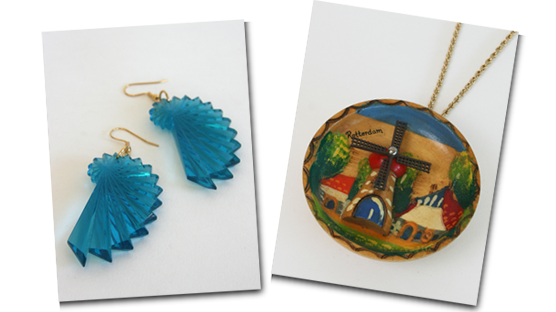 A pair of turquoise fan earrings and a wooden windmill giant pendant. Until a few weeks ago, I hadn’t picked up a pair of jewellery tools or pinged a jump ring since I closed my beloved fun rocker jewellery label on Valentines day in 2010. Interestingly though Lady Luck Rules OK had evolved from my Portobello stall in 2001 where I sold vintage jewellery and so a decade later I’ve come full circle and doing the thing I love most seeking out odd little objects and magicking them into accessories. Above is a pair of earrings I’ve made from 1960s Christmas decorations and a gigantic pendant necklace I’ve made from a wooden souvenir knick-knack which to my absolute joy was the first thing to sell when I launched the collection on Friday night. 1960s geometric owl pendant and diamante peacock brooch. Alongside my handmade jewellery I’ll be seeking out vintage pieces to fill the Thrift-ola Jewellery Box. 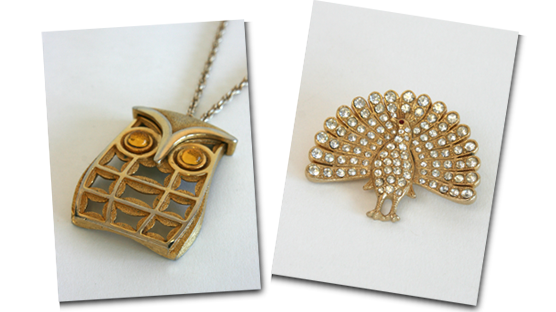 I don’t need a crystal ball and a headscarf to predict that birds will frequent the online shoppe and so far I’ve unearthed this stunning 1960s geometric owl necklace that has the most captivating amber eyes and an adorable peacock brooch decorated with dazzling crystals. Pink ice cream sundae necklace and blue telephone cord style necklace. I thrift jewellery from all sorts of places and I often go to sales held by Stylists who of course have a never ending supply of interesting pieces. 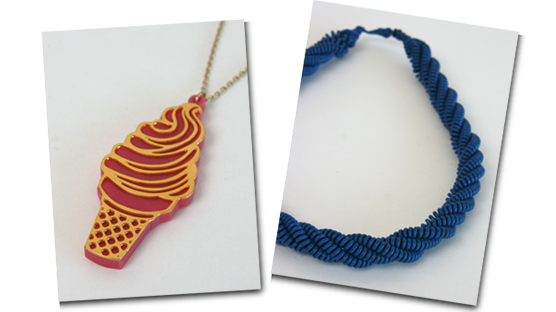 I recently bought this hot pink ice cream sundae necklace with golden filigree topper and electric blue telephone cord style necklace from a freelance stylist who was spring cleaning her fashion cupboard. Going for gold! 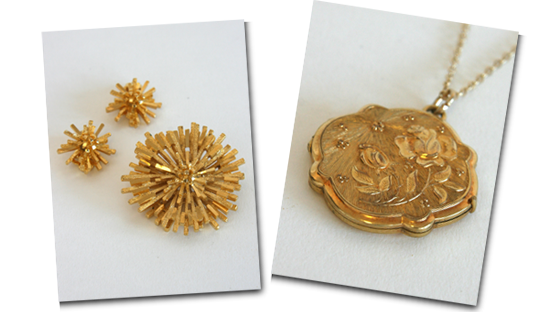 Sputnik style brooch and earring set and rose locket sourced in Paris. I also jump aboard the Eurostar a couple of times a year to source from flea markets in France. I visit the largest settlement of markets in Paris called St Ouen and often pick out a lot of gorgeous vintage charms and jewellery sets. Above is a 1950s sputnik style brooch and earring set and a romantic rose motif locket which I added to a chain. Lenticular brooches sourced from a Russian door to door salesman. Really. The most exciting thing about the Thrift-ola Jewellery Box is it’s not confined by era, style or current trends. 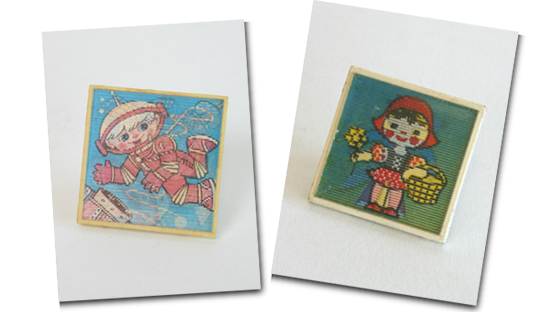 I select pieces that catch my eye based on their individuality and often whether or not they make me smile – like these 1960s lenticular brooches from Russia. As the images move on each brooch it tells a story from a rocket boy floating in space after escaping his rocketship to Little Red Riding Hood morphing into the big bad wolf. 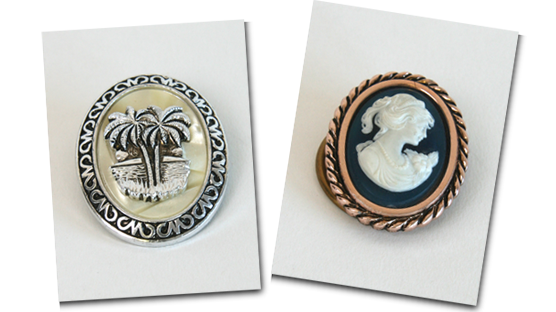 A pair of scarf clips featuring a palm tree and a cameo. I can’t help but be seduced by little jewels that attach onto and jazz up other accessories… I love 1980s shoe clips (which I’m on the hunt for) and really love a scarf clip! Above is a silver palm tree one and a classic cameo version. Wrap the scarf around your neck, take two scarf tips and pull them through the ring on the back until the clip reaches your neck. It feels very regal for some reason! 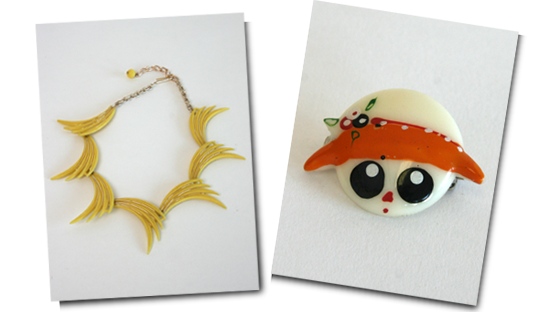 Stylised 1950s fan necklace and hand painted big eyed 1960s doll face brooch. I’ve really enjoyed sourcing and making the first 35 pieces in my new Thrift-ola jewellery collection. At various points since closing down LLROK I didn’t think I’d be able to make the return to jewellery but as long as I stay true to creating and sourcing the pieces I love, it should be a whole lotta fun!